Congratulations on receiving a United Way of Muscatine grant. As a recipient of these funds, we ask for your assistance in acknowledging this important financial support publicly. We are supplying you with instructions and tools to acknowledge the funding you receive, which will help show the link between United Way of Muscatine’s support and the excellent work you do. Any media or communication that recognizes other funding sources must also recognize United Way of Muscatine. Printed/promotional materials specific to the program being funded such as brochures, programs, newsletters, press releases, educational materials and announcements. Online materials including web sites, blogs, electronically distributed releases, and social media/networking. Signage: Credit may be given through wall text or a placard placed at the entrance to the program space. The United Way of Muscatine must be credited by using the United Way of Muscatine logo and/or credit line. The logo(s) provided to you must be produced as a unit without alteration. United Way of Muscatine’s logo may be used by recipients of United Way of Muscatine financial support for the sole purpose of acknowledging that support. 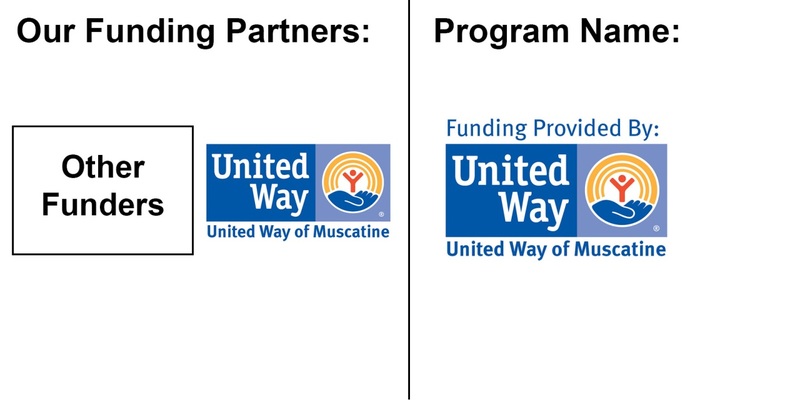 United Way of Muscatine’s logo should be used only in connection with the program for which funding is provided. It should not be used to imply broader affiliation or endorsement other than funding support, unless written consent of co-branding or broader context approval is given. Recipients of United Way of Muscatine’s funding should display the standard United Way of Muscatine logo in an area specifically dedicated to the recognition of funding partners whenever such dedicated space is available (e.g. a dedicated funding partner web page or so-labeled section of printed materials.) If no such space is available, the special-use “Funding Provided By” logo should be used. Download Logo Files: Click on the desired logo. When the logo displays on your screen, right-click the image to save the file.